A chromate-free pigment has a good anti-corrosion performance by the functions which passive a surface of a substrate due to its high oxidizability, forms an adamant deposited pellicle comes from reduction products of a chromate, and stabilizes the protective pellicle by a pH buffering. Good anti-corrosion performances like a chromate primer can be expected by the replacement to some pigments which have the similar anti-corrosion function to a chromate pigment. Furthermore, the organic binder’S design of a chromate-free primer which means selection of adhesive resins or additives is also effective. The substrate used in this study is a galvalume sheet (plating 55wt%A1-45wt%Zn) which has 0.5mm thickness, and pretreated by a chromate or chromate-free chemical conversion coating. The chromate primer containing strontium chromate (SrCr204) and the developed chromate-flee primer are coated on the substrate (chromate: 5g/m2, chromate-free:8.5g/m2). The top coating is polyether-melamine type binder (13.8g/m2). To select the effective anti-corrosion pigments, good adhesive resins or additives, samples in Table 1 were investigated. The corrosion resistance of a coil-coated galvalume sheet was measured by EIS (Electrochemical Impedalice spectroscopy) method using a potentiostat (TOYOTECNICA-VersaSTAT4) and the following call(Fig.1).The adhesion function between a primer and substrate Was evaluated by the electrolyzed delamination method applying a constant current to cause cathodic/anodic reactions using the following call(Fig.2). To evaluate anti—corrosion performance, cyclic corrosion test(CCT,5% NaCI salt splay test 2h–60C Dry4h–50CWet 2h)was used. The corrosion resistance of clear-lacquer-coated sheets (cut edge areas)in saturated solutions with various anti-corrosion pigments was shown in Fig.3. SrCr2O4 shown a very high value of corrosion resistance, it suggested that Cr pigment possessed a high performance for rust prevention due to a strong oxidizability and forming an adamant deposited pellicle. In contrast, Cr-freeⅠ possessed a low value 0f corrosion resistance, however combination of Cr-freeⅠand Ⅱor Ⅲ showed larger values of corrosion resistance than only Cr-freeⅠ. 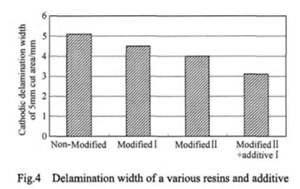 Cathodic delamination width of binders containing a various resins and an additive at the cut area was showed in Fig 4. 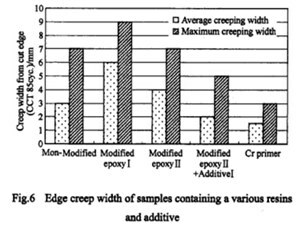 Modified epoxy resin Ⅱ indicated the shortest delamination width of the all rosins, furthermore the combination of additive I and modified epoxy resin showed the minimum width. 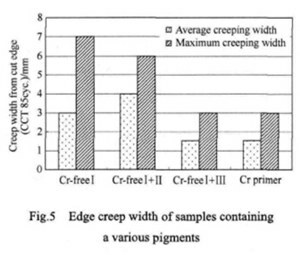 Edge creep width in cyclic corrosion test(CCT)o fthe samples containing various anti-corrosion pigments (Fig.5), and containing various epoxy resins or additive(Fig.6) were shown. The sample containing Cr-free Ⅱand Ⅲ(non-modified epoxy resin was used as a main binder) was indicated a good anti-corrosion performance. The CCT result at 85 cycles in Fig.5 showed the primer containing Cr-free Ⅰand Ⅲ possessed almost the same performance as of the Cr primer. Furthermore, the CCT result in Fig 6 showed the sample containing the modified epoxy resin Ⅱ(Cr-free 1 was used as anti-corrosion pigment) possessed better performance than the other epoxy resins, and combination of additive I showed the best anti-corrosion performance. (1)Anti-corrosion and adhesive performances were evaluated by electrochemical impedance spectroscopy(EIS) method and electrolyzed delamination method. (2)To compare corrosion resistance, it suggested that the combination of Cr-freeⅠand Ⅲpossessed the best rust prevention function. (3)In the comparison of cathodic delamination width was found that the modified epoxy resinⅡpossessed a good adhesion performance and the combination of modified epoxy resin Ⅱand additive I showed the best adhesion function. (4)The chromate-free primers containing the effective anti-corrosion pigment, adhesive resin and additive which selected by EIS or electrolyzed delamination method shown a good anti-corrosion performance at CCT 85 cycle.